Coach Jones and the Brookwood Broncos overcame a 21-0 deficit Friday night to best a tough Central Gwinnett team on the road 33-28. After posting an 0-3 start to the season for the first time in since 1986, Jones and the Broncos have won 4 straight and are now in n2nd place in tough 6A Region 8 play. Jones is Brookwood to the core. Growing up in Snellville and attending Brookwood, coached by his father, he was a captain on Brookwood’s first state championship team in 1996. In college he went on to play for Lou Holtz at South Carolina. Jones is in his first year at the helm of his alma mater. 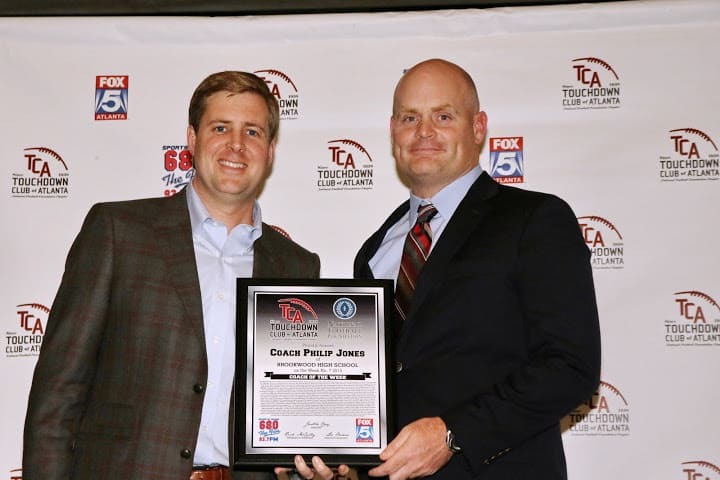 For his efforts against Central Gwinnett, we honor Coach Jones as our Coach of the Week.